A very cliched film that gets interesting when it comes to the conspiracy, but is never really believable at all. This is not a very good movie. for starters, it hits every cliche in the boo, including being incredibly predictable. the hero survives all sorts of situations where trained killers are trying to kill him, and for all reasons should be able to. it’s a conspiracy film, with the hero on the run from the law, having been setup by the bad guys. there’s a rogue cop who believes in him and is working the case from the other side of the law, as swagger (mark wahlberg) is on the run. there are definitely some cool moments and scenes in this film, and it holds your attention, but there are also way too many predictable moments of absurdity. by the end of the movie, things really get bad, as the film seems to not know how to find an ending. this movie could have worked, despite its cliched story, if only the action were a little better. as it is, nothing here is especially great. Shooter is exactly what it looks like from the trailer. it’s the kind of movie you would expect jason statham to make, and not mark wahlberg. then again, wahlberg has certainly found himself in dopey action movies that could easily be b movies, more often than most actors. some of these films include the yards, four brothers, and contraband. in Shooter, however, unlike those other movies, wahlberg is really the only star (unless you count danny glover, who had been out of the business for quite sometime before making this movie, and hasn’t really returned since.) the b movie with only one star is exactly what statham specializes in, and for wahlberg, it is way below his ability. 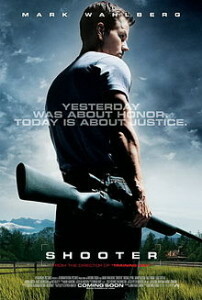 the movie is about a guy who is hired to help the fbi catch a man who is planning an assassination on the president. glover’s character, colonel johnson, tells bob lee swagger (wahlberg), that they received information about an assassination attempt. the shot will have to be taken from very far away and there’s only a handful of men in the world who can make that shot. since swagger is one of them, they want him to help them stop it. this is one of the most elementary premises imaginable. the intentionally funny, laughable movie machete was spoofing movies like this with it’s plot about a guy who is framed for an assassination attempt on a senator. this movie tries to take it seriously. so to start with, swagger and the team of fbi men setup in a spot overlooking where the president will be speaking, and they can see everything, only they never spot the person who is taking the shot. instead, a shot is fired, the president of africa, who is also speaking, is killed, and then the guys who hired swagger take shots at him. swagger is shot twice in the chest before falling through the window, crashing through a glass ceiling, and somehow surviving. he not only survives, but is able to attack an fbi man, steal the man’s car, drive into the ocean, and get out of the car, all without getting caught. this is not a realistic movie. there have been so many films about people outrunning the police, and most of them know that the character needs to stay hidden as much as possible and needs disguises. not this movie. it should have taken a page from the fugitive, and tried to at least be smart about things. instead, we have swagger on the run, finding a woman to take him in even though she knows all about what he’s involved with. he also manages to convince the fbi man, nick memphis (michael pena), that he isn’t the assassin, even though he only has one moment to say one line to memphis, while at the same time disarming him and stealing his car. even if memphis did have an inkiling of belief in this guy, he would suppress it out of anger for what this guy did to him. but in this movie, the rogue cop who is onto the bad guys, even though it might mean the end of his career, is a cliche they refuse to avoid. remember tommy lee jones in the fugitive telling richard kimble, “I don’t care.” when kimle tells him that he didn’t kill his wife. that’s the realistic attitude. this movie has none of it. as much as i hated the cliches, the conspiracy happens to be one of the better things about the movie. it goes all the way up to a senator (Of course), and memphis spends the first half of the movie chasing down leads, while swagger spends it running away from cops. in one ridiculous scene, three policemen confront him and he easily fights them all off and puts them down. even after he has attacked and successfully taken down the first two, and the last one has a gun on him, of course that gun never gets fired. at a certain point you shoot this guy in the leg. you do it just so he can’t attack you like he did to your buddies. this movie isn’t smart enough for that. there are only two really cool parts to this movie. the first is a scene where the bad guys have found out that memphis is on to them, and kidnap him in a van. they bring him to a house on the water, and tie him up in a way that they can make it look like he killed himself. that’s when swagger shows up from far away and starts shooting them, picking them off one by one. the cool part of that scene is the way that they were setting memphis up to look like he killed himself. the other neat moment is when memphis realizes that someone really did take the shot on the african president, and since there are only a handful of people who could have made it, he might be able to find out who the guy was. he goes to see an old marksman who knows the top names in the field and can give him an idea. the reason why this part is the best of the movie is because it is the only plot point that was unexpected and that you couldn’t see coming from a mile away. as far as the action, everything is very routine. that means lots of explosions and gun firing, but nothing we haven’t seen before. the movie is violent, and that’s fine, but some creativity would have been nice. something like we got from the clive owen movie, shoot ‘em up, a few years back. this is a typical conspiracy movie, and it gets worse as it nears an ending. you know that somehow this guy needs to clear his name, and that usually means he will have a recording and get the bad guys on tape, spilling out their whole evil plot. here, it doesn’t quite end that way, but what we get instead certainly isn’t any better. the ending of this movie is what absolutely falls apart, more than anything else. i don’t want to give anything away, except to ask one question. would the senator really go with them up to the mountain? it was just a mess. the movie up until then wasn’t very good, but it did hold your attention. you watch a movie like this, knowing that you’ve seen things just like it before, but still wanting to see how it all works out. if the action was a little better, this could have been a much cooler movie. it is fun, at times, but overall, just the usual cliched film without anything more.